Julia Mazur focuses her practice on complex litigation and counseling involving a wide range of intellectual property matters, including trademark, trade dress, unfair competition, false advertising, trade secret and patent litigation. She has extensive experience with all phases of civil litigation, from pleadings and preliminary injunctions to discovery, motion practice, trial and mediation both in federal court and before the Trademark Trial and Appeal Board. She also regularly assists clients through trademark clearance and pre-litigation enforcement and defense efforts. She has represented clients in a wide variety of industries, including the food and beverage, telecommunications, technology, beauty, fashion, furniture, metalforming, and pharmaceutical industries. Julia has been mentioned in several articles in Law360 and other publications in connection with cases where she has played a significant role. 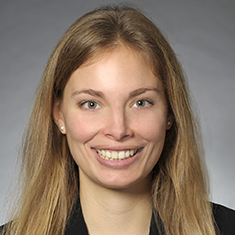 Additionally, she has contributed to the publication of a chapter on trademarks for the Thomson Reuters Westlaw and Association of Corporate Counsel treatise Successful Partnering Between Inside and Outside Counsel. Julia maintains an active pro bono practice as well. Most recently, she helped secure the release of a client who had been wrongfully imprisoned for over 24 years. She has also applied her understanding of trademark law to counsel pro bono clients through their re-branding efforts and the federal and state trademark registration processes. While in law school, Julia completed an externship with the Honorable Samuel Der-Yeghiayan of the US District Court for the Northern District of Illinois and worked at the Exoneration Project.